Toilets come in various shapes and sizes. Regardless of these, a proper toilet should be easy to use, durable and powerful enough to wash everything down in one flush. Other additional features just serve to make the unit better and thus, more ideal for your home. With this in mind, it is safe to assume that most people think of the best toilets as being expensive products, and the affordable ones as being substandard. However, if you do your research well, you will find some pretty good toilets. 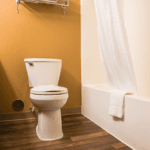 This article gives an in-depth review of the best affordable toilets, with a view of helping you find the best one for your home or office bathroom. 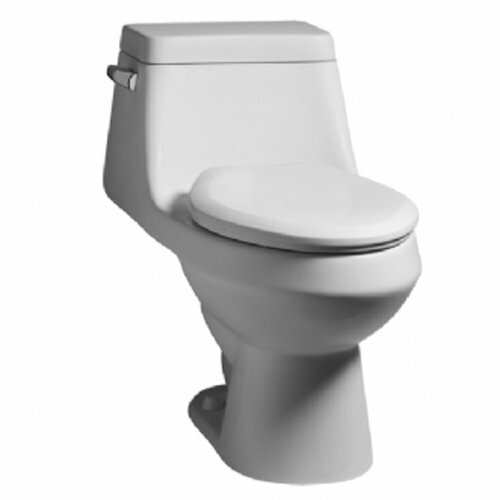 Kohler’s K-3987-0 is a two-piece toilet that has its bowl and tank shipped separately for easier management during installation. It features a class 5 flushing technology that is designed for bulk performance. Basically, this system comprises a large flush valve, which releases pressurized water to wash everything down and leave the toilet very clean after use. This flush system actually has a dual flush function, which is controlled by a left-hand nested trip lever to offer a choice of either releasing 1.1 gallons or 1.6 gallons of water per flush. The 1.1-gallon option is meant for flushing pee while the 1.6 gallons is meant for flushing poop, making the system very water efficient. Construction wise, the unit is made using ceramic and has a round-front bowl design, which makes it suitable for installation in smaller spaces such as in powder rooms and small bathrooms. It has a height of 29.25″, a width of 18” and a length of 27.75”, and is available in white, black, biscuit and almond colors. Round-front bowl design for easy fitting in small bathrooms and powder rooms. Left-hand nested trip lever offers a choice of either 1.1 or 1.6-Gallons per flush. 2-1/8 inch glazed trap way. Compatible with other products in the Wellworth collection. Does not come with a toilet seat. Toto’s CST243EF-01 Entrada is also a two-piece toilet with a round bowl for easy fitting in tight spaces such as in small bathrooms and powder rooms. 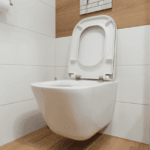 The product has a rim height of 16-1/8 inches, which is the universal height for regular-sized toilets and is made for at least a 12-inch rough-in to the finished toilet wall. In terms of design, the unit boasts of a traditional finish, with stately lines and a powerful yet quiet flush. On the flushing system, a left hand nested chrome trip lever is used to control the internal components to release 1.28 gallons per flush. Although this may seem like a lot as compared to Kohler’s unit above, it delivers strong water rush that pushes everything down easily, leaving the bowl as clean as new. This is made possible by a 3-inch-wide flush valve, which is 125% larger than conventional 2-inch valves in other similar sized toilets. The wideness means that a larger volume of water passes through and thus, the 1.28 GPF. On the downside, this toilet does not come with a toilet seat and is available in a cotton white color only. However, it has a pretty solid construction, which makes it very strong and sturdy. Comes as a 2 piece set (separate tank and bowl). Requires a minimum of 12 inches of rough-in from the finished wall. Powerful yet quiet 1.28-gallon flush. Left-hand nested chrome trip lever. Available only in a cotton white color. 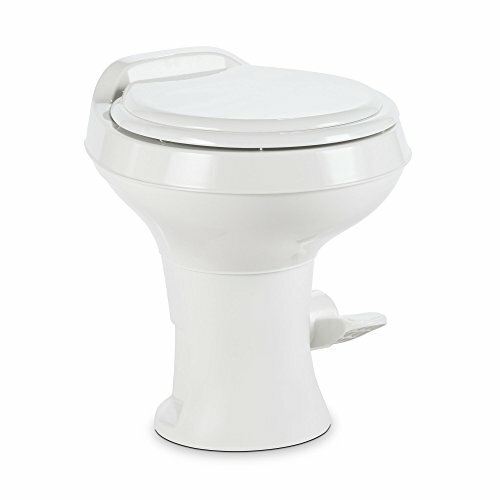 American Standard’s Fairfield is a one-piece toilet that is constructed using vitreous china. 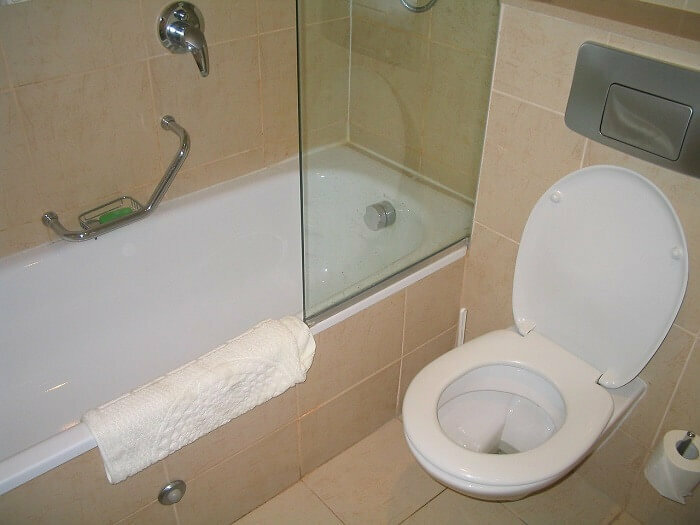 As a single unit, the toilet can be a bit difficult to handle, especially during installation. However, the vitreous china construction makes it tougher and denser so as to withstand a bit of rough handling during installation while also giving it a long lifespan. A polished chrome left-hand handle is installed to control the flushing system, and this adds on to the durability aspect of the toilet because chrome is strong and does not rust. In terms of size, the unit has a low-profile, with a height of only 26.38” from top to bottom, a width of 16.13” and a length of 29.25”. This size is ideal for very tight spaces such as in powder rooms. Despite this small size, it has an elongated siphoning action in its bowl, which enables it to deliver 1.6 gallons with quite some force. Assisted by a glazed trap way and a 3-inch flush valve, the flush water effectively pushes everything clear, leaving the toilet very clean, while saving quite a lot of water per flush. When it comes to accessories, this toilet comes with a color matched plastic toilet seat and cover, which makes the deal much better. However, it is only available in a white-color finish. Built as a one-piece set. Elongated siphoning action in the bowl. Comes with a color-matched plastic seat and cover. Polished chrome, side mounted actuator. Efficient 1.6 gallons per flush system. Dometic’s 300 series toilet is a very affordable product and this is because it has a gravity flush system that eliminates the need for a tank. Technically, it is shipped as a one-piece toilet but only as half the size. However, the bowl is full-sized, with a standard height of 18 inches. Structurally, the unit is made using polypropylene plastic, which is strong and durable, yet very lightweight. It also has a plastic foot pedal for controlling the flushing system and a plastic toilet seat cover to complete the set. As stated earlier, the toilet has a gravity flushing system, which works by releasing a powerful triple-jet rinse that flushes everything away by using only 1 pint (0.125 gallons) of water. The combination of this water efficiency, small size, and lightweight plastic construction makes the 300 series the best candidate for use in RVs. Additionally, the product is available in a low profile option so as to cater for the short guys or kids that come along as you go camping in your RV. Gravity flushing system, which means it does not have a tank. Foot pedal for controlling the flushing action. Comes with a plastic toilet seat cover. Flushes using only 1 pint of water. Available in a low profile option for shorter people. Comes in either a white or a bone color finish. 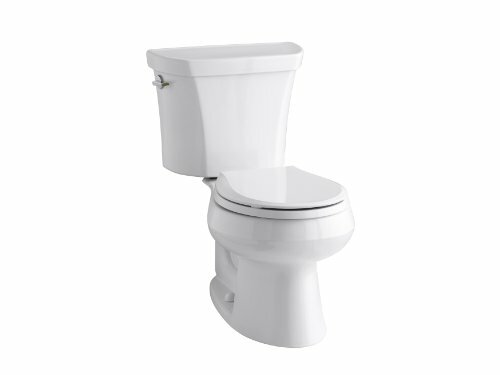 For a full-sized, 2-piece toilet, American Standard’s Cadet 3 is incredibly affordable. Despite this, it has some very impressive features, making it the best budget toilet. The unit features the Cadet Flushing System, which can handle up to 1000 grams of solid waste per single flush. This is made possible by its large 3” flush valve and a 2-1/8” trap way, which ensures that the powerful flush is directed quickly outside without leaving anything behind. 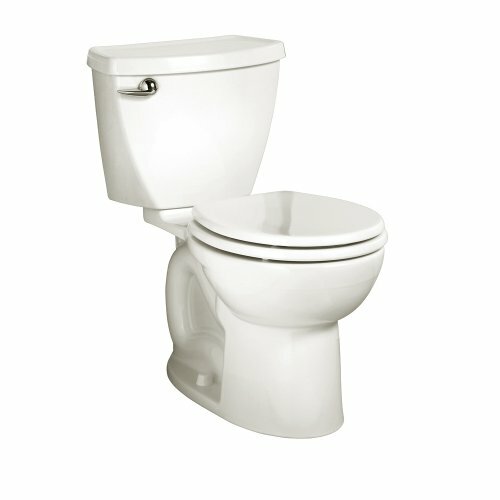 On matters efficiency, only 1.6 gallons of water is used per flush, making it a low consumption toilet. A chrome-finish trip lever is used to control the entire flushing system and is very easy to use. Construction wise, the toilet is made using vitreous china, which is very durable and easy to clean. This is topped off by the inclusion of an ever clean microbial surface that makes it a very hygienic unit to have in your bathroom. An important thing to note is that, during installation, the toilet requires at least a 12-inch rough-in from the finished wall surface. Requires at least a 12-inch rough-in from the finished wall. Available in white, linen and bone colors. 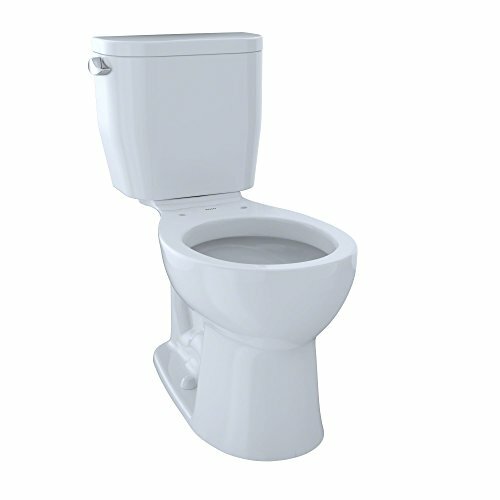 Peerless Pottery’s Hancock unit is a 2-piece toilet that is fully constructed using vitreous china, making it very strong and durable while also being very easy to clean. The toilet has a rim height of 15-3/8”, which is just slightly below the average size and thus, very comfortable to use by most people. Additionally, an elongated front bowl makes it more comfortable to use while also improving the hygiene levels. On the inside, a 2-inch flush valve is incorporated for providing the flushing power. This valve is controlled by a chrome trip lever and releases an economical 1.6 gallons per flush. To make the flushing more effective, a 1-7/8 inch glazed trap way ensures that everything that is flushed goes quickly down to the drain pipe. In terms of affordability, the Hancock is quite expensive as compared to the other toilets in this review. Elongated front bowl for comfort and hygiene purposes. Available in a Venetian pink color only. Requires a 12-inch rough in. Toilets are available in various shapes and sizes. However, some important things need to be considered before buying one. 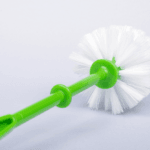 An expert advice on features such as flushing mechanisms, sizes, shapes, water-savings, noise, comfort, and ease of cleaning is required, and this is given below. Generally, toilets are available as either one or two-piece units. A one-piece toilet has its tank and bowl permanently fixed together. Although such units can be very difficult to handle when shipping and installing due to their size, they are generally smaller as compared to assembled two-piece toilets. 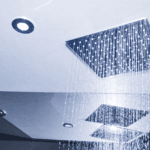 Therefore, they are ideal for small bathrooms and powder rooms. On the other hand, two-piece toilets are usually cheaper than their 1-piece counterparts and are easier to handle when installing because they come in parts, then assembled on site. Efficiency in toilets is considered in terms of the flushing system. The most efficient toilet is the one that has a dual flush function: one for a light flush and the other for a standard flush. Such a toilet is the best one to buy. Next in line is the toilet with a single flush function. With this, the one with the lowest GPF is the most efficient one and thus, the best one to buy. Third, are toilets with gravity flushing systems. By relying on the pressure from the water supply feeding the toilet, a lot of water can be wasted in trying to flush stubborn particles that won’t go down. Such toilets are only good for outdoor purposes such as when camping with your RV. It is not advisable to have such a system for home use. Maintaining hygiene in your bathroom is very important. 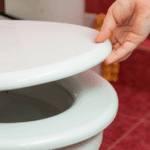 Generally, one-piece toilets are easier to clean because they have fewer nooks and crevasses as compared to two-piece toilets. In terms of materials, vitreous china is easier to clean as compared to porcelain or plastic. Therefore, if you are obsessed with cleanliness, a vitreous china one-piece toilet is the best one for you because it is much easier to maintain. Taller toilet bowls are more comfortable for taller people because they are easier on their backs and knees. These, however, are harder for kids and shorter people to use. Instead, the young ones are better off using low profile units because they are more comfortable for them. Therefore, if you intend to buy a toilet for general family use, consider the height of most of the family members and then buy the appropriate toilet size. If you get a unit with accessories, such as a toilet seat and cover, well and good. However, the cost factor kicks in here. If the attachment makes the toilet set very expensive, try to find out if buying the accessories separately is cheaper so as to get the best deal. As you can see, there is a lot about toilets that you probably didn’t know about. They may just be simple products to you, but if you want a good looking, efficient and affordable unit for your bathroom, it is important to get the best affordable toilet. After going through this article, you should be able to pick the best product from the six listed above.